These incredibly versatile clippers with their cooling face plate will make your job easier, handling everything from general purpose grooming to precision clipping, on any coat type. Smooth, quiet, reliable, and cool-running, these clippers deliver the same high-quality performance as the two-speed version, and are compatible with A5 Cryogen-X & Elite Cryogen-X blades and the wider Take-Down-Quick wide blade series. 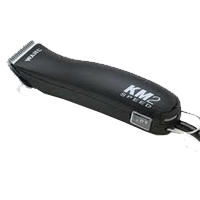 You’ll be able to tackle any coat type with these virtually unbreakable, powerful clippers, capable of handling everything from general purpose grooming to precision clipping, thanks to both normal and high speed settings. 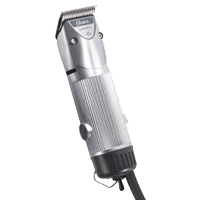 This clipper is compatible with A5 Cryogen-X amp; Elite Cryogen-X blades and the wider Take-Down-Quick wide blade series. Faster blade speeds and wider blade sweeps lets you groom more efficiently and productively, while the resilient, strong housings keep your clippers tough enough to handle any work conditions. Expect the same superb performance as the two-speed version with over 3,100 strokes per minute. 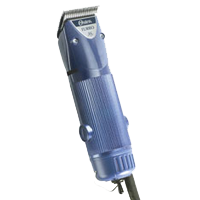 This clipper is compatible with A5 Cryogen-X & Elite Cryogen-X blades and the wider Take-Down-Quick wide blade series. The toughest work conditions are no match for these powerful clippers, which offer faster blade speeds and wider blade sweeps, along with better airflow and less noise during grooming. 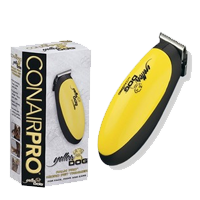 Virtually unbreakable, these clippers glide through thick, coarse hair easily, managing over 4,000 strokes per minute, and its detachable blade system provides you with incredible versatility. Packing a powerful punch, this machine is the choice of shearing professionals around the world for fitting cattle, shearing sheep and llamas. Its 3? head runs cooler than ever, and its clearly marked tension knob means easier blade adjustments for a variety of jobs. A 13-tooth comb and 4-point cutter give a high-quality shearing job with few second cuts in the fleece, and various other comb and cutter combinations are also available to handle all your jobs. 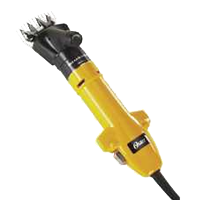 Handle your cattle, horses, lambs and other animal’s grooming with ease with these clippers that deliver 3,000 strokes per minute and stand up to any challenge, complete with an adjustable tension knob for easier blade adjustment and a quieter, cooler-running motor. Everything you need to fit your cattle, shear sheep and llamas, is standard fair in the ShowMaster?. Variable speeds, from 700 to 3,000 cutting strokes per minute, offer more trimming and fitting choices for your horses, cattle, sheep and goats, while clearly marked tension knobs provide easier blade adjustments. A 3″ shearing head with 20-tooth Goat comb and 4-point cutter also make life easier for shearing jobs, and a 13 tooth comb and 4 pt cutter as well as other comb and cutter combinations will make all your jobs a ‘sheer’ joy. Oster Blades and Guards available in store! Now with more cutting power and FREE 4 oz. bottle of D’Knot spray! Powerful sealed motor that requires no maintenance, is fan cooled and impact and chemical resistant! With an easy detacheable #10 Wide Ultimate Competition Series Blade you can cut longer and the blade stays cooler! 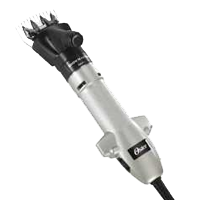 High torque 2 speed clipper cuts is perfect for full body clipping as well as trimming the face, bridle path and fetlocks. 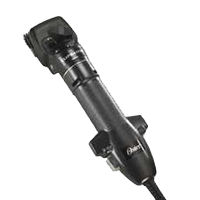 16 foot, heavy-duty power cord for easy use and maneuverability! 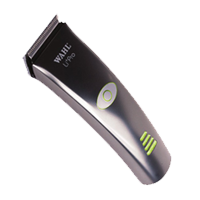 Includes: Clipper, Ultimate Competition Series #10 Wide detachable blade, New Bonus Item: 4oz. Spray bottle of D’Knot spray, storage case, cleaning brush, blade oil and instruction book. 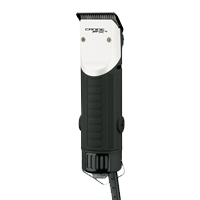 New innovative technology Professional Cord/Cordless lithium-ion clipper! New & Improved 5-level adjustable blade set is low maintenance and easy to clean. 75 Minutes of cordless runtime. Chip controlled motor for constant speed control & amazing power!. A multi-level battery capacity display that also has an indicator light to alert when blades need to be oiled!. Ergonomic body design has a one piece housing for extended comfort. Includes: Heavy duty aluminum carrying/storage case, charge stand, transformer, 6 slide on attachment combs, cleaning brush, oil, and instructions. 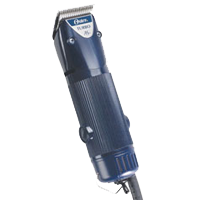 Powerful 2-speed AC motor delivers 3000 strokes per minute on low speed and 4000 strokes per minute on high speed for heavy-duty clipping. Extra set of brushes and springs included. High carbon steel, diamond lapped, detachable blades for long-lasting sharpness and cutting performance. Use to cut all coat types with smooth, efficient results. 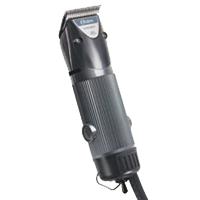 Sets new standard for AC motor clippers. Designed for trimming face and ears. Ergonomic shape fits comfortably in your hand. Cordless compact trimmer uses 1 AA battery (included), runs quietly, will not startle animals.